Zoltrog has many resolutions for the Earth year 2010. Most of these resolutions end in your death and Earth's ultimate destruction, but since Zoltrog has made that mission quite clear, Zoltrog will discuss the resolutions which do not concern you dying painfully. Nor the ones where you die pleasurably. 1. Locate Mrs. Field, take her out-of-this-world cookies, then take her as one of my many wives. 2. Lose these few extra pounds gained over the holiday season stuffing all available pockets with human appendages. 3. Take neither me-time nor we-time and instead engage in spacetime. 4. Resurrect Earth legend Elvis then send 8 inch by 10 inch photo of Elvis to Elvis along with self-addressed stamped envelope in hopes of receiving photo back with Elvis Earth autograph. 5. Write the next great American novel about an alien who visits Earth and is welcomed as a superior life form with highly advanced sexual technologies which he uses to cure Earth women of their dissatisfaction with laughable single penised beings. Largely non-fiction. Oh, and expect the New Year's festivities to change in the future. Certain things will not be the same. First, New Year's eye glasses made to feature numbers within the design will no long provide enjoyment, only lasers into the faces of other humans you look at to wish a happy new year. It will only be a happy new year if they planned on be decapitated above the collar bone, mwahaha! Second, your sound-emitting Earth party favors will no longer emit sound or amusement, but rather a deadly, slow-working toxin which will make slaves of all of you. But, I assure you, amusement will emit from me heartily! 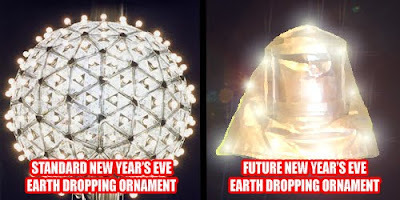 And third, your New Year's Eve dropping ornament will be updated! You will celebrate only fear as Zoltrog's likeness propels toward you on the ground in a mere 10 Earth seconds!